It pours slightly cloudy copper color with a bright white head. Sweet yeasty Belgian Funk on the nose. It is somewhat difficult to describe. It is sweet, sour, tart and bready. Oh My, this is very unusual, you will either love it or hate it. It is such a unique taste I don’t see much leeway either way. It starts out sweet but just for a split second then it is a continuing build up of sour, tart, and funk. This is mouth puckering. Really, like you just sucked on a sour lemon! Upfront this is not for everyone. Actually I’m not sure why I like it. I tote a snobby well balanced beer etc. There is nothing balanced about this beer. It is really all funk. Let me try to explain this. It is sweet as it touches the tip of you tongue. Then by the time it travels to the middle of your tongue it starts to turn sour. The sour builds to an extreme tartness by mid sip. At the top of the swallow you can feel the back of your jaw start to quiver. By the time you are ready to swallow you can barely keep your face from puckering. The back end of the swallow and finish is almost dry. All of these is with a very yeasty background. After that you step back and wonder what just happened. If you never had this style of beer before you would think it must have went bad or something; wondering if it is really suppose to taste like that. Well, there is not much I can say. 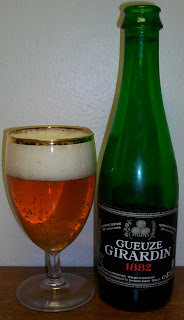 Gueuze is the ultimate in Belgian Funk. Some Belgians like the Fruit Lambics, Saisons, and the Flemish Reds have a sourness or tartness to them. That is nothing compared to the extreme sourness of this beer. It is a very unusual beer that is worth trying. You never know you may also be a Belgian Funk Lover.